Weight: a little heavy for extended trips but love the spaciousness! Hard to rate this product having mixed feelings! Have used it extensively on numerous hikes and treks and have taken it around the world for 15 months. Sierra Designs put some stiffening tape on the zipper fly-covers as I did not like the way they caught in the zipper constantly. They did this for free although I paid half shipping and handling. Some great features on this tent and a great design though at the end of the day it does not perform its basic function; keeping you dry! It drips in heavy rain; I could feel the slight spray come through the tent in Patagonia where the wind drove it through the walls. I tried spraying it with silicone but to no avail. Will send it to Sierra Designs at the end of the season here in Canada for a water test and see what they do about it. I'll write another review then. 1) Dripping! In wet weather the flysheet will sag, touching the tent mesh top roof--you get drips onto your face or sleeping bag's lower area (depending on your orientation). The SD customer service would not send me a new fly and suggested I put pieces of sponge in the two problem areas between the fly and tent. I tried it and it works pretty well. 2) The fly zippers get caught on zipper flaps, especially when it's wet. I've used this tent for three years, almost exclusively in Vermont summers/falls. More often than not, conditions have been wet and/or humid. I've loved many of the features that this tent offers -- great space, ease of set-up, good vestibule -- but I continue to have drip problems. I initially thought that I had a bad fly, but Sierra Designs replaced the original (without hassle, I should add), and the problem persists. My current theory is that the problem is largely design-inherent. 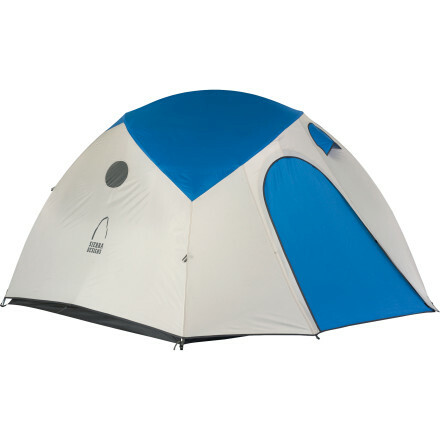 The tent uses a diagonal center pole that arcs across the roof without a sleeve (uses clips instead). In humid conditions, I think you get condensation on this pole which then drips onto and through the mesh. I've also found that setting up the fly to stay taut and away from the tent is tough, so that you tend to get seepage from fly to tent in storms. With a down bag to protect, I'm looking for a new tent. Although others have complained of moisture inside their Meteor Light, I was certainly "hung out to dry" by this tent's manufacturer. I'm writing this review so that if you do own or decide to purchase a newer-model Meteor Light, know that the poles are irreplaceable. The tent pictured, at right, is not the same model of Meteor Light reviewed by all these other reviewers. The tent they are reviewing is the Meteor Light CD 2. In 2009, Sierra Designs radically changed the design of their award-winning tent, creating what you see in the picture to the right. It was made in 2009 and 2010, thereafter, the Meteor Light disappeared off the face of the map, along with the crazy pole system (which there were two versions of, one with aluminum spider connection and one with plastic ones). This Meteor Light has two poles instead of the CD's 3 poles. One is a straight pole. This is called the "ridge" pole. The second pole is a bizarre, "patent-pending", design. Sierra Designs calls this the "eye" pole. If you look closely at it, you will see that it is very unique. On to my story: I was enjoying my tent, and had used it a few times, camping, when I errantly left my poles at a campsite. I called Sierra Designs (and their parts outfitter, American Recreational, and they told me that they do not stock any bow poles. (Apparently, they never did). I called the manufacturer, DAC. They told me that Sierra Designs had not ordered any, so no replacement units were ever built. This pole can not be duplicated: Even Tent Pole Technologies, who specialize in restoring or reconstructing damaged or lost poles, couldn't build one of these. 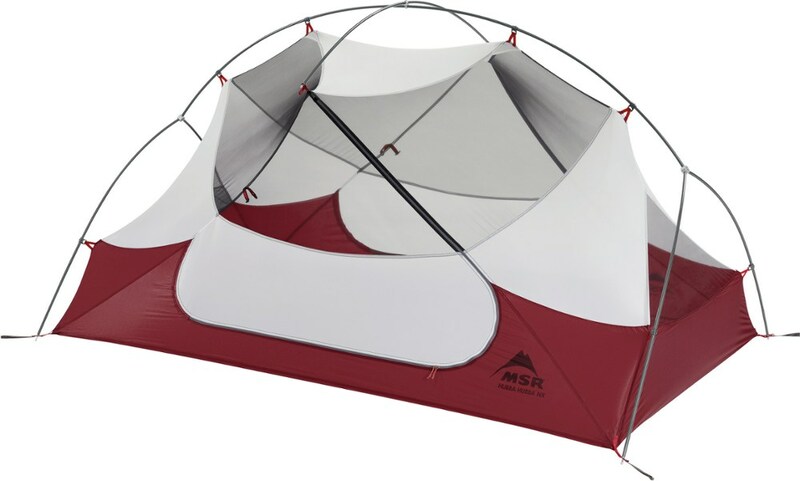 After eliminating an award-winning design, which was their flagship 2-person tent for over a decade, Sierra Designs totally re-configured the Meteor Light with a pole system that was "patent-pending", and then, after one year, totally scrapped this design, and the Meteor Light with it. 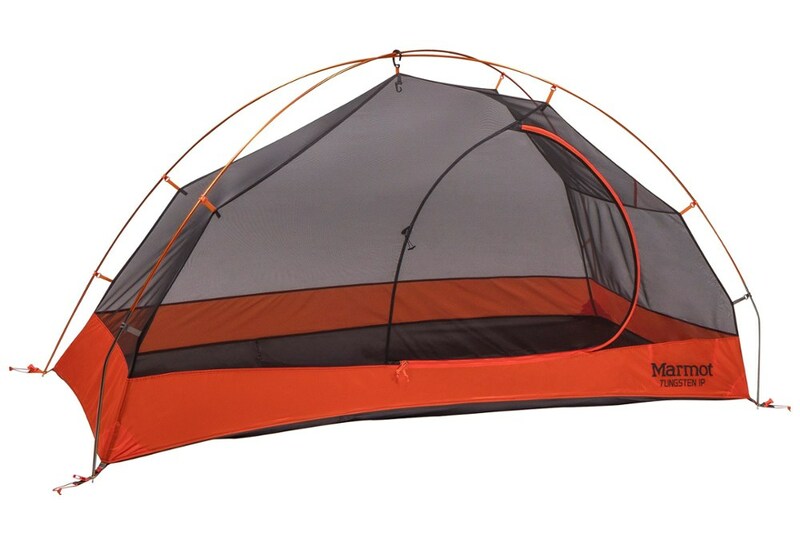 Their newest tent, the Lightning 2, has a pole system much like the original Meteor Light CD. The adhesive glue on the fly that secures the plastic windows dissolves after a few washings, rendering the fly useless. The sleeve that the ridge pole goes in is a frustrating, time-consuming design, especially in the cold, rain, or clouds of bugs. Roomy, easy to set up. It was our big luxury on our through hike of the AT in 1990. So this is the tent my wife and I bought for our through hike of the AT in 1990. It was great to set up as a bug free pavillion for midday breaks, and when we were holed up in it on rainy mornings, it was great to be able to sit up or have room for stuff at my feet while lying down; I'm 6'4". The fact that they still sell the same tent says a lot. Customer service has been pretty good, including putting in new zippers when the old ones wore out a few years ago. The only problem I have had with the materials is that when the bungees in the poles got wet, they lost stretch. When I called, I got told, "yeah that's what happens" which seems strange for an outdoor product. The fix is to take off the end of the pole and pull out the cord until it is tight enough, then tie a new knot in it. Another time, we were driving across the country, and put the damp tent on top of our stuff in the trunk of our car. When we set up the tent that night in New Mexico, the poles were too long! It turns out that the nylon had melted. You could see and feel shiny places in the fabric where the threads had fused. Over the next week or so, we stretched it back out by pulling really hard on it to get it on the poles. So it is really true — don't let nylon tents get hot! It's a wonderful tent. It's easy to set up, with only three poles. Two are slip-ins, and the last is a clip in. The toughest part is getting the fly on the right way. It's not quick--or maybe it's me--but the fastest I've set it up is about ten minutes. I've used it nearly every weekend this past summer (June- late Sept), and so far it's showing no durability issues whatsoever. The two doors are great if your partner is a frequent night-time bathroom runner, or if you both want to sit up in the tent with the doors open and view stars for a while before sleeping. The mesh ceilling allows some views, but nothing as detailed as stargazing. It's rain worthy. We got caught in a summer storm in the Wallowa mountains at about 4,000ft, and it varied from a torrential downpour to a strong rain for 16 hours. At times we could see the lightening through the tent fly walls, but it remained water tight. The only pproblem was that after 14 hours or so, the fly started to soak, and new rain drops were hitting with such force that it would cause a spray onto the mesh cieling, which then dripped into the tent. Bummer. We solved this by pulling out one of those blue tarps, and setting that on top of the fly. It was an unusually hard rain storm, and only after 14 hours did we have problems. Also important is to remember that the guy cords start to stretch when wet, and one must get out there and re-tension the guy cords. The large fly vestibule was great for holding lots of gear dry, while we holed up inside. The storm flap on the fly zipper does easily get caught, but there's an easy way of using one's finger to keep in out of the way. 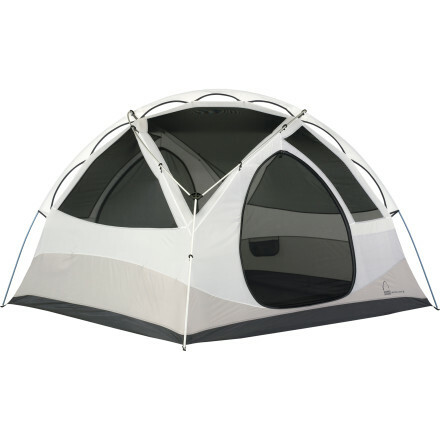 It's a little on the heavy side, but for two people that can split the weight, we think it's a great tent. Though we don't mind being close, it's also nice not to be stuck on top of each other when it's raining for a long time, and the extra weight/space makes it worthwhile. I've used this tent for four years and it has endured torrential all-night thunderstorm rains, one foot of wet snow, freezing rain, sleet, hail(ping pong-sized), and winds exceeding 50 mph on exposed ridges. All common in the Guadalupe Mountains NP. In addition, I've slept in temps in the low teens, but it gets a little cool with all that no-see-um netting. The vestibule is rather large. The only gripe about the vestibule is you have to really reach to zip the fly all the way shut and hope the storm flap doesn't get caught on the zipper. There's plenty of room inside the 40sq ft tent for two people and gear. Lots of sit up room as well. I've never had a leak and condensation has never occurred inside the tent, it has, however, occurred on the inside of the fly, but this was due to calm wind conditions. 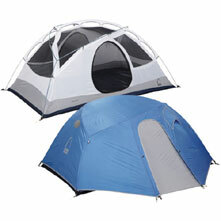 This tent pitches very taut and with common sense staking and guying it can handle rather tough weather. The tent is definitely heavier than advertised. The weight I quoted includes stakes for the tent (8), fly (5)and guy points (4), and the SD ground cloth. Overall, a very solid tent. Ease of Setup: 3 equal length poles w/ 2 sleeves and 1 clip pole. Clip on vestibule. Very fast setup. I've used this tent everywhere over the last three years. Down in the Grand Canyon, Glacier Nat. Park, four treeline camp spots in CO. etc. My best story is when I was in the Boundary Waters in upper Minnesota in late October and experienced HUGE winds and rain and about a 1/2" of gumball sized hail. The tent was solid and didn't leak a drop. I had North Face before this and am much more satisfied now. I just hope I don't wreck it. If I did, I'd buy another one. The vestibule is about the roomiest you can get (14 s.f.) and allows sheltered storage of all your gear. It would be tight if you tried to get 2 people in it for a 4 or 5 day trip, but car camping without the gear storage factor is easy for 2. It's long, so if you're tall it doesn't touch your toes. It looks cool too. I've had this tent for seveal seasons and have found it very useful and versatile. Setup is very easy. The roof vents do a good job, but heavy Pacific NW condensation conditions occasionally cuase water to drip in. Size for two is excellent, vestibule will hold your packs and boots. A bit heavy for long trips, but I like the space. I have had this tent for just about two years now and I have had no large problems with it. The ties to tie back the vestibule are slightly clumbsy but that is the least of your worries. My first night in the rain with this supurb tent I was a little nervous. Not one leak! I would sleep in it during any rain storms. The floor has one seam down the middle (if I designed the tent it would not be there) that I seam sealed and have had no problems with. The vestibule is big so that your pack can be sheltered from the rain. With a large screen ceiling ventilation is fabulous. 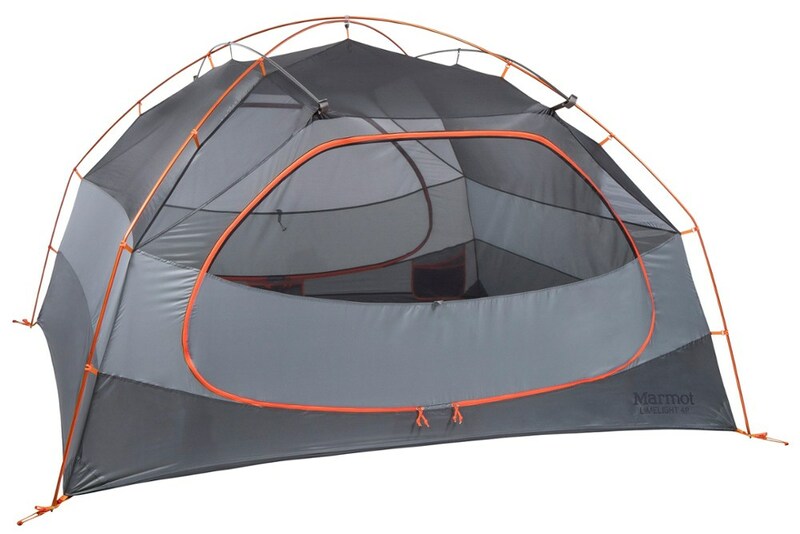 If you chose to buy this tent be sure to get a gear attic. Gear attics realy keep your floor organized and your stuff will not be sat on or grounded into the floor. The Sierra Designs Meteor Light 2 is not available from the stores we monitor. It was last seen May 31, 2018	at Moosejaw.